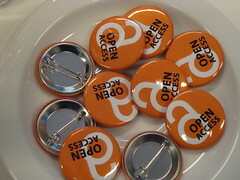 Open access policy was developed late last year and adopted/implemented in March. They have had it live for 86 days, so he’s not an expert, but has learned a lot in the process. His college is small, and he expects less than 40 publications submitted a year, and they are using the institutional repository to manage this. They have cut about 2/3 of their journal collections over the past decade, preferring publisher package deals and open access publications. They have identified the need to advocate for open access as a goal of the library. They are using open source software where they can, hosted and managed by a third party. The policy borrowed heavily from others, and it is a rights-retention mandate in the style of Harvard. One piece of advice they had was to not focus on the specifics of implementation within the policy. The policy states that it will be automatically granted, but waivers are available for embargo or publisher prohibitions. There are no restrictions on where they can publish, and they are encouraged to remove restrictive language from contracts and author addendum. Even with waivers, all articles are deposited to at least a “closed” archive. It stipulates that they are only interested in peer-reviewed articles, and are not concerned with which version of the article is deposited. Anything published or contracted to be published before the adoption date is not required to comply, but they can if they want to. The funding, as one may expect, was left out. The library is going to cover the open access fees, with matching funds from the provost. Unused funds will be carried over year to year. This was presented to the faculty as a way to ensure that their rights were being respected when they publish their work. Nothing was said about the library and our traditional concerns about saving money and opening access to local research output. 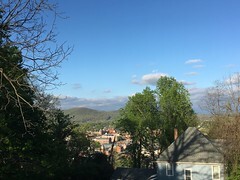 The web hub will include the policy, a FAQ, recommended author addendum based on publisher, funding information, and other material related to the process. The faculty will be self-depositing, with review/edit by Kern. They have a monthly newsletter/blog to let the campus know about faculty and student publications, so they are using this to identify materials that should be submitted to the collection. He’s also using Stephen X. Flynn’s code to identify OA articles via SHERPA/RoMEO to find the ones already published that can be used to populate the repository. They are keeping the senior projects closed in order to keep faculty/student collaborations private (and faculty research data offline until they publish). They have learned that the policy is dependent on faculty seeing open access as a reality and library keeping faculty informed of the issues. They were not prepared for how fast they would get this through and that submissions would begin. Don’t expect faculty to be copyright lawyers. Keep the submission process as simple as possible, and allow them to use alternatives like email or paper. Libraries have been relatively quietly collecting ebooks for years, but it wasn’t until the Kindle came out that public interest in ebooks was aroused. Users exposure and expectations for ebooks has been raised, with notable impact on academic libraries. From 2010-2011, the number of ebooks in academic libraries doubled. Wellesley is platform agnostic — they look for the best deal with the best content. Locally, they have seen an overall increase in unique titles viewed, a dramatic increase in pages viewed, a modest decrease in pages printed, and a dramatic increase in downloads. In February 2012, they sent a survey to all of their users, with incentives (iPad, gift cards, etc.) and a platform (Zoomerang) provided by Springer. They had a 57% response rate (likely iPad-influenced), and 71% have used ebooks (51% used ebooks from the Wellesley College Library). If the survey respondent had not used ebooks, they were skipped to the end of the survey, because they were only interested in data from those who have used ebooks. A high percent of the non-library ebooks were from free sources like Google Books, Project Gutenberg, Internet Archive, etc. Most of the respondents ranked search within the text and offline reading or download to device among the most important functionality aspects, even higher than printing. Most of the faculty respondents found ebooks to be an acceptable option, but prefer to use print. Fewer students found ebooks an acceptable option, and preferred print more than faculty. There is a reason that will be aparent later in the talk. The sciences preferred ebooks more than other areas, and found them generally more acceptable than other areas, but the difference is slight. Nearly all faculty who used ebooks would continue to, ranging from preferring them to reluctant acceptance. Whether they love or hate ebooks, most users skimmed/search and read a small number of consecutive pages or a full chapter. However, ebooks haters almost never read an entire book, and most of the others infrequently did so. Nearly everyone read ebooks on a computer/laptop. Ebook lovers used devices, and ebook haters were more likely to have printed it out. Most would prefer to not use their computer/laptop, and the ebook lovers would rather use their devices. Faculty are more likely to own or plan to purchase a device than students, which may be why faculty find ebooks more acceptable than students. Maybe providing devices to them would be helpful? How does the robustness of ebook collections effect use and attitudes? Is there a correlation between tablet/device use and attitudes? Are attitudes toward shared ebooks (library) different from attitudes toward personal ebooks? The full text of the white paper is available from Springer. If someone checks out a physical book, do you know if they really read it? 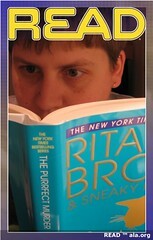 If someone accesses an ebook, do you know if they really read it? If a faculty member has a print book checked out for a year, is it more valuable to them than an ebook they access several times? Sometimes, the title format in the catalog record can influence what is found and used. Vendor records can sometimes have series names in the beginning of the title, which the cataloger would not do with print. ISBNs don’t match/merge easily. His solution was to remove the check digit and the prefix, and match on the “ISBN 9”. This works, mostly, but another solution was needed. Ended up having to do a lot of matching to pull together useful comparison of circulation and download data to compare e versus p use. They found that when both formats were available, a little over half of the print books were used, and less than half of the ebooks were used. Of the titles used in both formats, there was higher use all around. The lowest level of use came from ebooks where the print was not checked out at all. 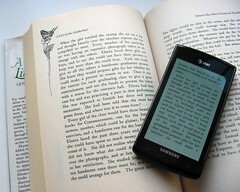 Use of electronic books may lead to print, but use of print doesn’t seem to lead to electronic. It may be that if dual format is higher it may be that good books get used no matter what format they are in. It may also be that e-discovery drives p-use. Future considerations: the role of discovery and the role of ILL in a demand for print when electronic is available. This year I participated in the “set your own challenge” book reading thinger on Goodreads. Initially, I set mine at 25, as a little stretch goal from my average of 19 books per year over the past four years. But, I was doing so well in the early part of the year that I increased it to 30. The final total was 27, but I’m part-way through several books that I just didn’t have time to finish as the clocked ticked down to the end of the year. What worked well for me this time: audiobooks. I read more of them than paper books this year, and it forced me to expand to a variety of topics and styles I would not have patience for in print. What failed me this time: getting hung up on a book I felt obligated to finish, but did not excite me to continue on it, so I kept avoiding it. To be fair, part of what turned me off was on disc two, I accidentally set my car’s CD player to shuffle. This is great for adding some variety to music listening, but it made for confusing and abrupt transitions from one topic/focus to another. I read a lot of non-fiction, because that works better in audio format for me, and I read more audio than printed (either in paper or electronic) books. For 2013, I’d like to read more fiction, which means reading more in print. Which means making time for my “must read the whole book cover to cover” method of reading fiction. SERU was heavily involved in putting this session together. SERU hopes to put away with the madness of licensing and come up with mutually agreeable terms. Most libraries purchase ebooks in order to make them available 24/7 to their users. While they haven’t grown to proportion sizes larger than print in library collections, they are heading there. Researchers like ebooks because they don’t have to return them, and are more accessible than print books in the developing world. Students appreciate the ease of accessibility, particularly distance learnings, but given the choice they would take print over e every time. Libraries like them because there are easier/better ways of assessing usage and value to their users, but there are licensing and DRM headaches. He has worked for large publishers, but now works for a small, new publisher. What’s hard for a new publisher to break into the library market? Creating awareness, providing value — acquisition librarians are already overwhelmed with sales pitches via email. Authors may be wary of working with an unknown outlet when there are so many other options. They have to figure out ways to do this creatively. Well, being an e-only publisher means they don’t have responsibility for a print legacy that needs to be converted to online. That’s easy. They also have more freedom to experiment, particularly with pricing models. And SERU. That’s easy. They also don’t have their own platform, so they make the books available on established providers libraries are already comfortable using. When they created the ebook side of the press, they modeled it after the ejournal side, with similar tiered pricing. They also work with the other ebook platforms and their pricing and licensing models. While the ejournal collection sales are significant, they were surprised to find that ebook collections were not as popular as individual title sales. They thought selling ebooks would be easy, since they already had existing relationships. MARC records, pricing, technology — not as easy as they thought. Squeezing the ebook model into the ejournal model doesn’t quite fit. It’s easy to set up multiple sales models, but harder to get information about who the customers are and using that to make business decisions. They’re a little worried that if they give up DRM it will impact print sales, but it’s obviously pretty unpopular and they do want the books to be used. They’re thinking about future formats — EPUB3, HTML5 — they need to keep up. They’re thinking about new ways to sell the content, and increasing the number of platforms and partners they work with. Serials come first at Springer (because they’re 80% of your materials budget). But, he’ll talk about ebooks today. The STM publisher’s preference is to sell ebooks in packages directly to libraries, but there are other models based on library or patron selection that have some appeal. Eventually, market forces will probably mean they’ll have to do something with PDA. In the post-PDA world, maybe we stop selecting and make sure that our systems are solid for allowing our users to find the best, most relevant content in an un-scoped collection. Might also mean giving up some of our concepts about what librarianship is. The easy stuff: Libraries are the traditional purchasers of scholarly books, and publishers know how many print books we’ve purchased from them in the past. Many eresource issues were resolved with ejournals. SERU. The volume discount approach to selling ebook packages can work if the per unit cost is low, the percentage of portfolio used is high, and the spend is commensurate with print spend, but with more titles. Include textbooks and reference books in the package. Remove DRM, pair with liberal use and ILL permissions. The not so easy, but not so hard stuff: Editors and authors have not had an easy time coming to terms with ebooks, much like print on demand. Discovery layer for ebooks is still the catalog, and it’s not down to the full text quite yet. Tablets are great for ebooks, and as they get more popular on campuses, ebooks get used more. Might have to give up the concept of book as a full thing and be okay with chapter-level reading. Most scholarly books outside of the humanities and social sciences are not read as a whole.